Offering all manner of technical how-to (and how not to) and other technical content. I specalize in OpenStack, VMware, and most things automation and cloud related. © 2019. This work is licensed under a Creative Commons Attribution 4.0 International License. With the holiday season over, I found I had an excess of USB powered fairy style LED lights that needed something to do. 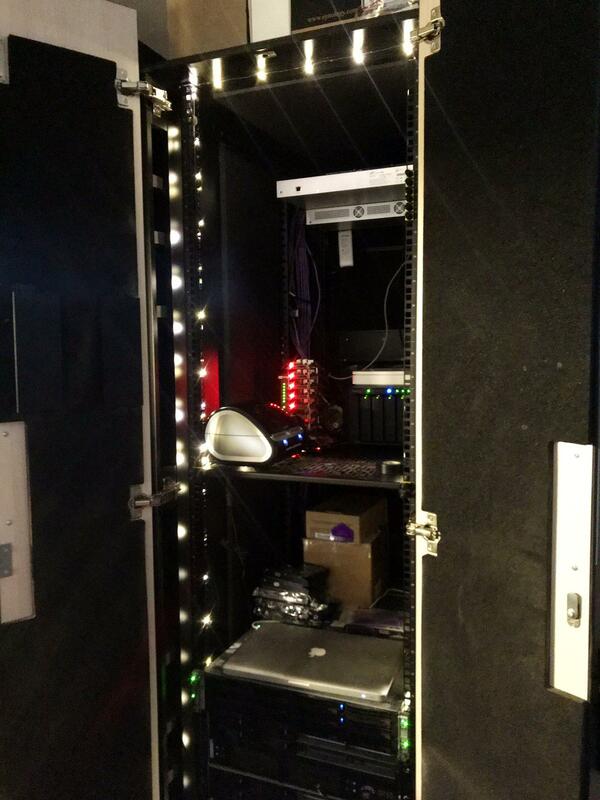 The garage that the home lab cabinet lives in is also darker than usual during these winter months. Like the Brady Bunch theme song then, these two must somehow come together… and now, THERE ARE DOOR LIGHTS. Simple enough, right? What follows then is the documentation of said build, some action shots, and what might get done differently next time. Before we get into the parts list, remember that this build happened with parts on hand. Everything except the Pi Cobbler came from an Arduino starter kit. I do not recall the specific one, but most “IoT” starter kits will include these things. The light sensor circuit I built, and instructions on how to do so came from here. With the hardware build out of the way, the next step was to use a bit of software to pull tie everything together. 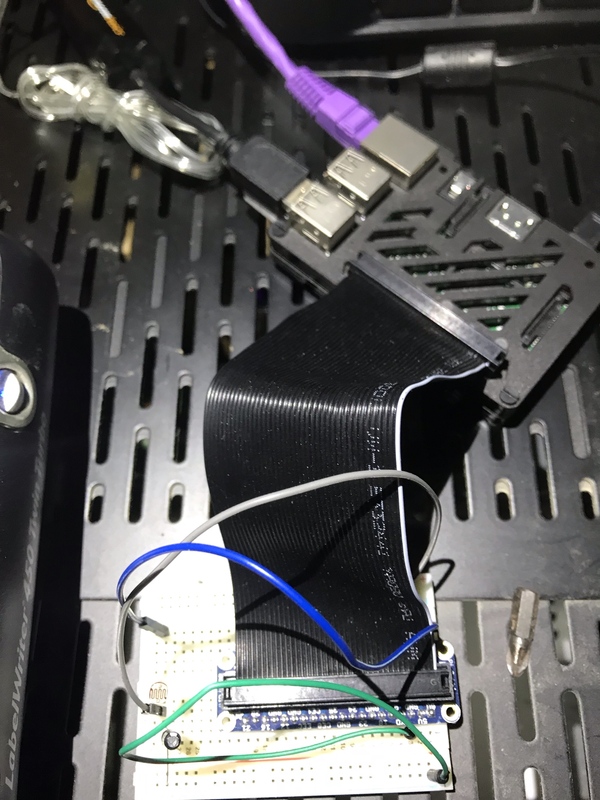 Almost 100% of the difficulty I had getting the software to work is related to how the existing USB libraries handle switchable USB Hubs. You see, instead of messing with relays or other bits of circuitry, the Raspberry Pi 3 Model B (and others) has the ability to entirely shut off the onboard USB ports. YES! Or so I thought. Docker? Yes, and not because everything needs to run in a container. Rather, because I can build and run ARM images for Docker on my laptop and consume the same images on the Raspberry Pi, which speeds up building said images. Moreover, because I was not 115% sure what packages, libraries, configurations, and any other changes were required, running in a container allowed me to keep the host OS on the Raspberry Pi clean. Which is a good thing, as that Pi also runs Pi-Hole and nobody wants a DNS outage. The first line imports the LightSensor class from the gpiozero Python library. This provides all the functions we will need to see if the sensor we wired up is getting light. If it is, that means that the cabinet doors are indeed open. The second line imports a modified version of hub_ctrl.py from the GNUK project. More on this file in a bit. Line 4 tells Python that we have a light sensor on pin 4. Line 5 prints the current state to the console. Lines 7 - 13 are where the fun happens. We start a loop and then wait for it to become light. When it does, we turn on the LED lights and then wait for it to get dark again. Earlier in the post I mentioned how the USB libraries in Python do not seem to provide convenience methods for controlling switchable USB hubs. 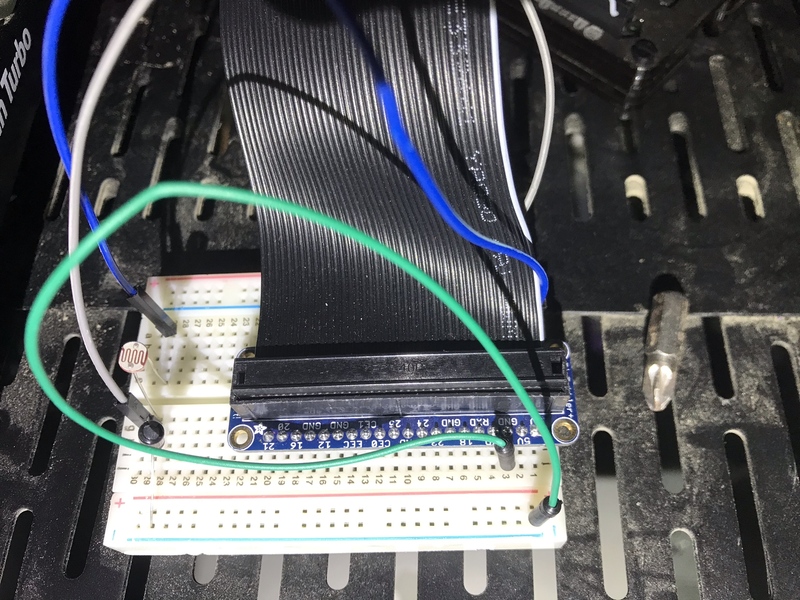 This led down a rabbit hole of USB protocol debugging with usbmon. That is, until I found this code from the GnuK project. 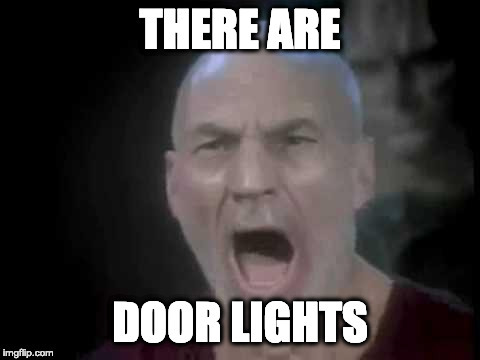 The only bit that was missing was a nice way to call it from door_lights.py. To that end, I added a send_command function to said file, that wrapped up a bit of their existing code. What follows is going to be a slightly expanded form of the live tweeting I will be doing all week. That is, the post will be lightly edited and written stream of consciousness style. I was a little late to the keynotes today, so missed the beginning. That said, there was a lot going on, and all of it good. OpenStack is the infrastructure on which Oerlikon produces 40,000 bobbins of thread a day. They’re using OpenStack infrastructure to back end containers, AI/ML (for making real-time decisions on production lines). This takes inputs from about 70k sensors per 120 machines. The theme has been the same as the last bunch of Summits. 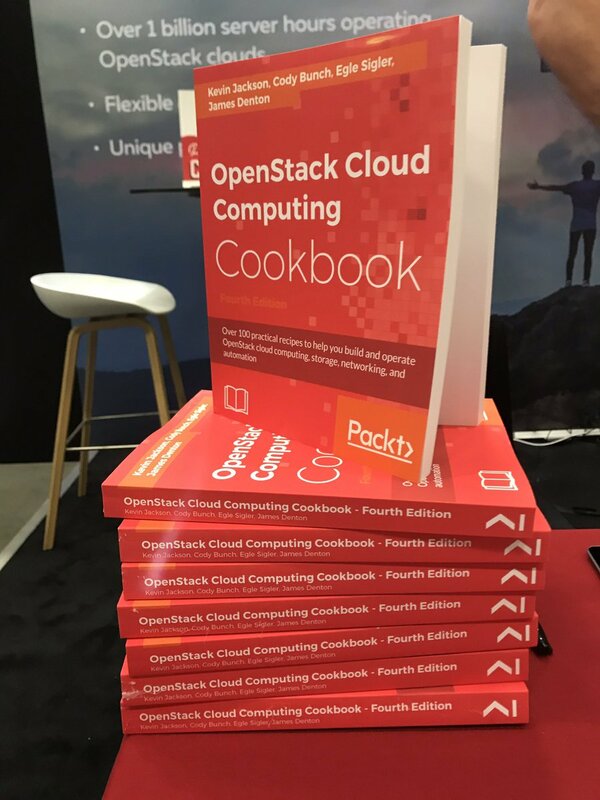 That is, OpenStack has matured as an infrastructure platform and is the infrastructure supporting more shiny workloads (AI/ML, Kubernetes, etc). Focus on Day 2 Operations. Infrastructure, at scale, is difficult. There is an Internet of Cows. The marketplace, aka show floor gets a special call out for being busier than the last handful of summits. There is a good showing of OpenStack service providers along with the usual players (RedHat, Canonical, Cisco, Netapp, etc.). There are also new players, hyper.sh and Ambedded. Toward the end of the day, I accidentally my Twitter account. That is, the account got locked due to unusual activity. That said, I managed to capture most of my day 1 sessions well and will get those posts up once the videos are available. Note: This will configure all interfaces that have “Ethernet” listed in the name. You can narrow this search by using Get-NetAdapter. Note: This will configure all interfaces that have “Ethernet” listed in the name. You can narrow this search by using Get-NetIPInterface. Note: This is generally considered a bad idea. You can get a lot more specific with Set-NetFirewallProfile, and I suggest you do. Note -SkipNetworkProfileCheck <- This saved me quite a bit of heartache. PSRemoting can be rather flaky, the -SkipNetworkProfileCheck flag made it somewhat less so. Recently my world has been centered more and more around Windows. Lately this is not a Bad Thing™. In fact, Windows Server Core and PowerShell have both come a LONG way. In the not so recent past, I wrote about how to set up Active Directory with PowerShell. In this post, I show you how to use PowerShell to join said domain. A server to join to the domain. A user account with access to said domain. A local user account on the server to be joined. This can be done in two ways, either rename & reboot, or rename as part of the join. I have found the two reboot process to work more consistently. Last, we join the domain. Note: Only the -DomainName parameter is required. If the others are left unspecified, you will be prompted. Because finding a complete sample was harder than I want to admit, here is a copy of my current cloudbase-init file. Community is a wonderful thing. Just today I needed to learn all I could about NSX. 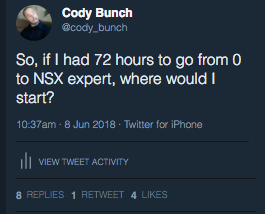 The goal was to become an NSX “Expert” by Monday. NSX is a bit too complex for that, but, when asked, the community responded with plenty of links and suggestions. What follows here are a pile of links and my rough plan of attack. Also worth mentioning, the official VMware NSX YouTube Channel. There are a huge number of guides here, but they are comprehensive. You will need to search for NSX specific labs. Recommended was getting started and then working as best as you could along with the study guides linked prior. When all else fails check the docs. When the docs fail, check the communities forums. A few more links came up overnight that should be shared. A PDF Guide to architecting NSX solutions for service providers. This will help you wrap your head around some of the considerations for how to deploy NSX within the context of the VMware SDDC. The ultimate HOL, is of course, setting it up yourself. This is a subset of the docs that walks you through an installation. UPDATE 2018-06-09 @ 09:40 More Links! Note: This may need to be sent more than once to actually do the thing. Here I’ll supply two of these. The first will do hosts in parallel, with a random delay up to MAXWAIT. This is for any number of reasons. The primary being to be nice to the power infrastructure where you are performing the resets. It is also a useful snippet for chaos style resets. seq -f "10.127.20.%g" 1 100 | xargs -I X "sleep $((RANDOM % MAXWAIT)) ipmitool -I lan -H X -U root chassis bootdev pxe && ipmitool -I lan -H X -U root power reset"
This second option is a bit more yolo, and fires off all the resets ta once. seq -f "10.127.20.%g" 1 100 | xargs -I X "ipmitool -I lan -H X -U root chassis bootdev pxe && ipmitool -I lan -H X -U root power reset"
Now that you’ve installed ADFS, let’s examine what we actually ran. The script first installs NuGet. This is used to install 3rd party modules. Note: Replace $fqdn with the FQDN for the ADFS host. When creating the SSL certificate, we stored the thumbprint for the certificate in a variable so we can use it again when configuring ADFS. This final bit of the script grabs the username of the current user, and then creates a credential object for the service account that ADFS will use. Next it installs the ADFS feature Install-WindowsFeature. You can validate that the ADFS role was installed and is running by browsing to https://<FQDN OF HOST>/adfs/fs/federationserverservice.asmx after the certificate warning you should get a bunch of XML. $certThumbprint = "Your SSL Cert Thumbprint here"
In this post we used PowerShell to install, configure, and validate Active Directory Federation Services (ADFS). This in turn enables you to use Active Directory as an identity provider with all manner of 3rd party SSO tools. So, it’s not quite perfect, but it’s workable. 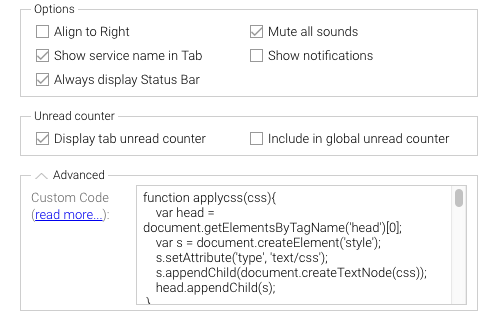 The theme itself is CSS, and there are a few ways to get Slack to use said CSS, depending on how you consume Slack. The links in the resources section below discuss how to do it via browser or desktop client. What follows here, is how to apply said theme using Rambox. Note: I feel like I’m a bit late to the party both theme wise and to Rambox. Rambox is everything Adium / Pidgin wanted to be when it grew up, and lets me pull in Slack, Tweetdeck, and others into one spot. In the “Advanced” text field, copy and paste the code from here. 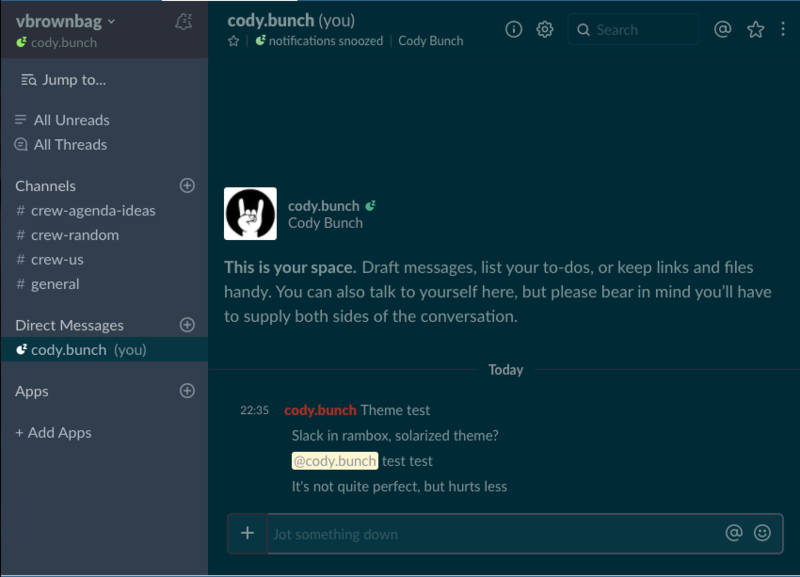 Slack Dark Theme - A Dark / Black theme that covers most elements. I changed the color values to that of Solarized CSS. The first stop in our metrics adventure was to install and configure Netdata to collect system level statistics. We then configured all of the remote Netdata agents to send all of their data to a central proxy node. This is a great start, however, it is not without some challenges. That is, the data supplied by Netdata, while extensive, needs to be stored elsewhere for more than basic reporting, analysis, and trending. What then should we do with said data? In addition to allowing you to stream data between Netdata instances as we did in our prior post, you can also stream to various databases, both standard and specialized. As we are exploring TICK stack, we will stream our metrics data into InfluxDB, a specialized time-series database. InfluxDB is the “I” in TICK Stack. InfluxDB is a time series database, designed specifically for metrics and event data. This is a good thing, as we have quite an extensive set of system metrics provided by Netdata that we will want to retain so we can observe trends over time or search for anomalies. In this post we will configure InfluxDB to receive data from Netdata. Additionally, we will reconfigure our Netdata proxy node to ship metric data to InfluxDB. Take a moment to review the configuration and metrics collection architecture from our first post. Reviewed? Good. While Netdata will allow us to ship metrics data from each installed instance of Netdata, this can be quite noisy, or not otherwise provide the control you would like. Fortunately, the configuration to send metrics data is the same in either case. One other consideration when shipping data from Netdata to InfluxDB, is how best to take the data in. Netdata supports different data export types: graphite, opentsdb, json, and prometheus. Our environment will be configured to send data using the opentsdb telnet interface. Note: As none of these are native to InfluxDB, they are exceedingly difficult to use with InfluxDB-Relay. Once this playbook has run, your netdata instance will start shipping data. Or, trying to anyways, we haven’t yet installed and configured InfluxDB to capture it. Let’s do that now. As discussed above, InfluxDB is a stable, reliable, timeseries database. Tuned for storing our metrics for long term trending. For this environment we are going to install a single small node. Optimizing and scaling are a topic in and of themselves. To ease installation and maintenance, InfluxDB will be installed using the ansible-influxdb role. The following Ansible playbook configures the ansible-influxdb role to listen for opentsdb messages from our Netdata instance. After this playbook run is successful, you will have an instance of InfluxDB collecting stats from your Netdata proxy! With that, you now have high resolution system metrics being collected and sent to InfluxDB for longer term storage, analysis, and more.